Whether Mother Nature brings several feet of snow or only an inch, improper shoveling can result in serious injury. Here are some tips for safely clearing your driveways, sidewalks, and paths! While snow can be beautiful as it comes down, after the storm is another thing entirely as we get the shovels out and begin to clear our driveways, sidewalks, and paths. Shoveling snow can be incredibly hard work, especially when the snow is wet and heavy, or if you aren't used to such physical activity. Whether Mother Nature brings several feet of snow or only an inch, shoveling snow can result in serious injury when done improperly. Here are some tips for clearing the snow without injury! Are you physically fit enough to shovel snow? Shoveling snow is incredibly demanding and puts a significant strain on your back and heart. If you suffer from back pain or heart problems, it's better to let someone else do the shoveling. If no one else is available to perform this chore for you, consider purchasing a snow-blower, as this will significantly reduce (but not eliminate) strain on your back and heart. If you do suffer from any health conditions such as heart disease, high blood pressure, or back issues, or are middle-aged or older, it is recommended to consult with a doctor before doing any strenuous shoveling. Have you taken steps to prepare before shoveling? Shoveling snow is an incredibly demanding task, and with any physically demanding exercise, it's important to warm up before starting. Consider doing a few warm up stretches and flexing exercises to loosen up your muscles before picking up the shovel. This may sound silly, but any physical trainer will tell you that stretching is one of the most important things that you can do to prevent injury. 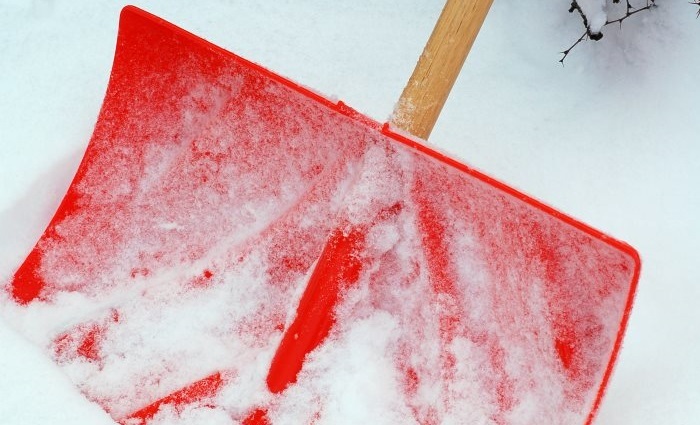 Have you picked the right snow shovel? When selecting a snow shovel, many people go for the largest shovel that they can find and this can be a mistake. Larger shovels hold more snow and can place a greater strain on your back, muscles, and heart. Look for a shovel that is relatively light, with a handle long enough that you don't need to stoop or bend over to shovel. Ergonomically-designed shovels are a great option that will significantly reduce your need to bend over repeatedly while shoveling. The job of a snow shovel is to make this task easier, not to place additional and unnecessary strain on your body. Don't forget to bundle up! It's cold out there, so make sure to dress in layers so that you keep warm. It's much safer to take your time than to try to rush through it and get back into the warm indoors! Layer up and wear clothing and coats that are warm yet easy to move around in. Make sure that your head (especially your ears) and hands are covered, and that you're comfortable. The more comfortable you are, the less strain you are placing on your body. You probably want to clear your driveway, sidewalks, and paths as quickly as possible and get back inside, but it's much safer to take your time and clear the snow at a steady, comfortable, pace. This reduces the chances of you becoming fatigued and / or suffering an injury. If you feel that you need to take a break, step inside for a bit, you can always continue the shoveling later. When taking breaks, be sure that they are long enough to adequately relax your muscles. One of the most common mistakes made when shoveling is lifting the snow rather than pushing it. Try using your snow shovel to push snow clear of your driveway, sidewalks, and paths much like a plow would, rather than lifting each shovel full of the white stuff and dumping it to the side. This will significantly increase the amount of snow you can clear without becoming fatigued as well as reduce the strain on your back and heart. If you must lift, take only a small shovel full at a time that you can easily lift without straining. When throwing snow, be sure to turn rather than twist at the waist. An easy rule of thumb is that your feet should always be facing in the direction that you're throwing. Twisting at the waist can increase the likelihood of back injury. Waiting until there is a foot of snow outside can create a rather large project, not to mention a much harder snow removal. Consider shoveling periodically throughout the course of the snow storm in order to reduce how physically demanding any single shoveling is. We hope that you found these Snow Shoveling Safety Tips helpful! Now that your driveway, sidewalks, and paths are clear, take a moment to warm up with a cup of hot chocolate or hot tea! As always, should you have a need for any of our services, please do not hesitate to Contact Us! we're happy to help!